BatchGeo is a free service that lets you create maps. It is really easy to use BatchGeo. Instead of having to enter tons of data into their program - I was pleasantly surprised that I could simply drag and drop an Excel sheet onto their page, and it would do all the rest of the work itself! It can be a little confusing to figure out at first. The only other thing I would have liked is if there were more color "pins" I could get for labeling different things. We own a lot of properties on the East Coast, so this program makes it easier to batch data by state, then overlap them to see a total picture! Google Maps API is a mapping platform that includes driving directions, Street View imagery and others. Maptitude Geographic Information System (GIS) software gives you the tools, maps, and demographic data you need to analyze and understand how geography affects you and your business. MapInfo Professional is a powerful mapping and geographic analysis application designed to show the relationship between data and geography in a visual way. 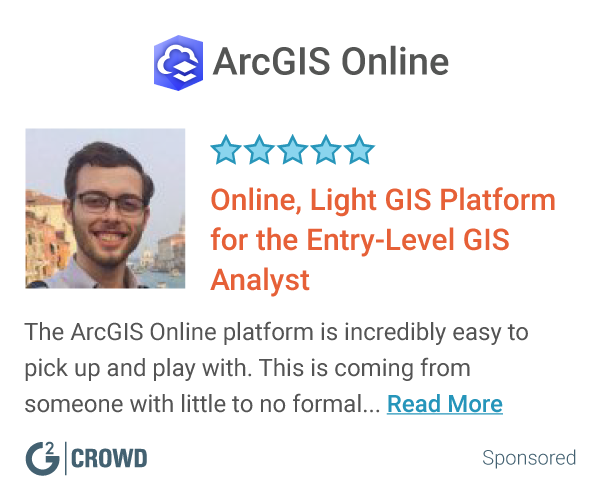 ArcGIS Pro provides professional 2D and 3D mapping in an intuitive user interface with visualization, analytics, image processing, data management, and integration..
* We monitor all BatchGeo reviews to prevent fraudulent reviews and keep review quality high. We do not post reviews by company employees or direct competitors. Validated reviews require the user to submit a screenshot of the product containing their user ID, in order to verify a user is an actual user of the product. Hi there! Are you looking to implement a solution like BatchGeo?